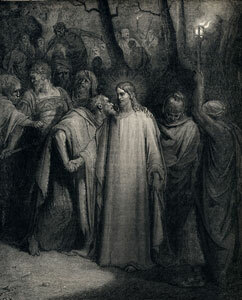 Today we sadly remember the betrayal of Jesus, as Judas Iscariot conspired to hand Him over for 30 pieces of silver. Jesus had trusted Judas as a friend and a brother. And now His trusted friend who had eaten with Him had risen up against Him (Psalm 41:10). The betrayal of Jesus calls to mind the betrayals we have experienced. Some are minor, such as a friend’s breaking a promise or someone’s using us for their advantage. Others are major—such as the infidelity of a spouse or being rejected by family members. Betrayal is a very painful emotional event. Our own experience of betrayal gives us a small glimpse of what Jesus must have felt when He was betrayed by Judas. As we unite ourselves today with the betrayed Jesus, we pray for healing from the betrayals we have experienced and the divine grace to forgive our betrayers. As the resurrection of Jesus brought victory over His betrayal and the cross, by that same grace, may healing, goodness, and strength arise from the pain of the betrayals that have befallen us.